I have been putting together a scrapbook of pictures, cards, letters, and memorabilia from the doula clients who have so graciously shared such items with me. As the 8×8 book comes together, I find myself full of memories of each story. I have not forgotten a single birth. Not one. Each one is a treasure I carry with me wherever I go. There is a weight to each memory. A weight characterized by humble, gritty, glorious women at their peak vulnerability and strength. Never is a woman so beautiful as when she is bringing new life into our small world. A brand new human being, who has never existed before, has been formed painstakingly, and brought with blood, sweat, and tears into the arms of his loving parents. My gratitude for this work will never wane. Sometimes, it is hard for me to believe that this is a path God has called me to so clearly. Unequivocally, with women is where I belong. Thank you for being part of my journey. Whether you are a client, a mentor, a colleague, or a member of my amazing family, I could not do this without you. I attended three in the space of about 40 hours this weekend. Two butter births on a Saturday morning. Both filled with intense power and work, capped by peace when they were all over. The other a triumphant victory, and a step toward healing of a past rough experience. There was the most spectacular sunrise on the way to one of the births. I have never seen one that struck my heart so deeply. The very sky seemed on fire. Too bad I was driving, and couldn’t capture it to share with you. A fitting beginning for the act of creation that is birth. Though the baby didn’t enter the world with the dawn, the dawn greeted him anyway. I was struck, as I watched each mama work hard to bring her baby to her arms in her own way. Each one unique. No two women labor alike. And thousands do it together everyday. What a marvelous sisterhood we share! I was reminded, yet again, why I do this work. Why I am a doula. Why I want to be “with woman” as a midwife. This work is sacred. Beautiful. Insanely difficult. But so very worth it. I rarely write poetry, but I hope these verses hit home. Each one represents one of the mothers I served this weekend. They’re kind of silly. Just haikus, but I had fun writing them. Enjoy. Can’t quite keep up, but she does. Me holding the fruit of my sister’s labor, Baby Ellie. I think that might be one of the most intelligent questions I have ever been asked. I knew the answer immediately, and had to keep it short. As a doula, part of my training is to identify and evaluate my personal biases, and how they might affect the care I give. From the beginning of my career then, I have always had to think about these kinds of questions. I have had to evaluate whether or not I ought to set boundaries around which kinds of clients I will or will not take on. If I do set boundaries, what should they be, and why? I started doula work because I wanted to be a midwife. That has a great impact on the types of clients I prefer to serve. (And doulas – admit you have a preference – we all do. Anyone who says they don’t is selling something.) Of course, I have often served outside my comfort zone, and while I don’t regret it, I have often been burned. Not by the client, but by really rough rides. Birth work is hard. In order to be a good doula, there is a certain amount of emotional investment I must make if I am to be effective at all. The line between professional and personal relationship gets a little bit blurred, and so I carry a bit of each birth with me, wherever I go. I can remember every birth I have ever been to, and how it made me feel as a woman, mother, wife, and human being. So, yes. I have an ideal client, and I have discovered that it has very little to do with circumstances, and everything to do with the client herself. My ideal client is one who educates herself, and who takes full responsibility for the choices she makes along the way during her birthing year. She doesn’t take her care provider’s word for everything. She doesn’t take my word for everything, either, but makes her own decisions. My ideal client educates herself by taking classes, or reading evidence-based books and online resources. She knows how to evaluate information, weighing it against her instincts and risk factors, confidently choosing what is right for her and her baby. My ideal client understands informed consent and refusal. She understands her patient/client rights, and asks intelligent, informed questions to gain insight into what is best for her and her baby. She is willing to keep an open mind and explore the benefits, risks, and alternatives to each option available to her. My ideal client understands that a birth plan is not a list of demands to be met, but a conversation to be had. She understands that her choice of provider and place of birth is important. If she cannot make her ideal choice (because that can’t always happen), she is able to communicate her needs effectively, and to make the best she can of a tough situation. She knows when to compromise, and when to stand her ground. My ideal client is flexible. She understands the wisdom of learning non-medical pain management, because her birth may go too fast to get the epidural she planned for. She knows that her labor may go on longer than she thought, and she needs the nap an epidural can help her get. My ideal client knows that there is no “one-size-fits-all” birth, and she is prepared to advocate for her needs, and the needs of her baby. My ideal client almost doesn’t need a doula, but she will benefit greatly from hiring one. Probably 99% of women who hire me fall into this ideal. Women are intelligent, thoughtful, flexible, and strong–and I am there for them when all they need is the reminder that these things are true of them. In your line of work, who is your ideal client? Why or why not? As a mom who hired a doula, how does this post make you feel? Being a doula, for me, is not about changing hospital policy, or steering women away from “bad” providers. It is not about disseminating information to every client. It’s not about birth plans. It’s not about informed consent. It’s not about vaginal birth, home birth, or cesarean birth. It’s not about statistics. It’s not about rebozos, crock pots, or rice socks. It’s not even about making a difference or changing the world. Being a doula is about laying aside my notion of what a particular birth ought to be, and instead surrendering to what it actually is. It is opening my eyes to the reality of each woman’s circumstances, and meeting her right where she happens to be. It is seeing beyond myself, and stepping into someone else’s experience. It is opening my hands in service, in whatever way the mother sees fit. It is about humbling myself, and understanding that each birth can and will teach me something I did not know before. It is about respecting the care provider(s) my client has chosen, simply because she has chosen them. It is about learning how to show respect and compassion to everyone in the room, even when I don’t feel like it, because it is the right thing to do. Many times, it’s about being an example. It is about protecting space around a birthing woman and her partner, so all they see is each other. It’s about becoming invisible, so that the birthing woman can focus on what is most important. It is about being with this woman, right here, in this moment in time. It is often about helping her surrender fully to this great work she is doing. It is looking her in the eye and lending her my strength when she runs out. It is opening a door when she hits her wall. It is about believing her when she expresses pain, and validating her struggle. It is believing in her, even if no one else does. It is about bringing a little bit of sunshine into this storm that feels so big, and reminding her that it will not last forever. 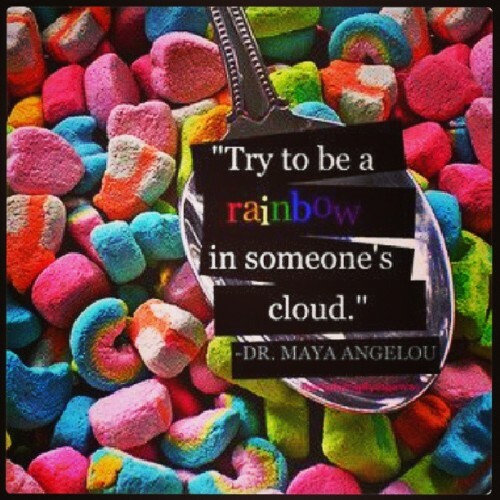 Being a doula is a lot like trying to be a rainbow in someone’s cloud. And I love being a doula.